First of all, the 5N features a brand-new sensor with specs very similar to the NEX C3’s. Note that this sensor offers a wide range of ISO—from ISO 100 to a very ambitious ISO 25,600. In term of usability, the NEX 5N is the first of the NEX series with a touch screen. Overall, the gap between the Sony NEX C3 and the Sony NEX 5N seems narrower than the one between its predecessors, the NEX and the NEX 5. Let’s see if our test results can confirm that. 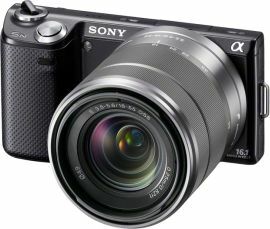 No surprise here: the Sony NEX 5N takes full advantage of the Sony 16 Mpix sensor with an overall score of 77. The portrait and landscape score are also very high. And the low-light ISO score is pretty good, especially for an APS-C.
As we said, the NEX 5N is much more than simply a new version of the NEX 5. Its sensor is very different and so are its DxOMark scores, too. More freedom in terms of ISO: you can choose an ISO down to 100 ISO and take full advantage of the sensor quality, which is one of the best we’ve measured at low ISO. Less noise: at any ISO setting, the NEX 5N gains 1/3 of a stop, so you won’t have to push the ISO as high as the NEX 5, naturally reducing the noise. Check the low-light ISO score for more details. No surprise either re: the comparison of the NEX 5N with the NEX C3. As both cameras use the same sensor, the results are almost the same. The slight difference comes from the availability of the ISO 100 setting on the NEX 5N, giving it an additional excellent mark. Overall, these two cameras are very close, even in term of price. In this comparison between the NEX 5N and the Nikon J1 and V1, the size of the APS-C sensor gives a large advantage to the NEX 5N. So the J1 and V1 can’t really compete with the NEX 5N, just as they couldn’t compete with the NEX C3 in our review of the Nikon 1 series. The NEX 5N comes very close to the A77 and even surpasses the latter’s low-light ISO score. This was to be expected because the A77 sits behind a semi-transparent mirror that deflects part of the light away from the sensor. So the real comparison will be between the NEX 5N and the mirror-less Sony NEX 7. As this comparison between the NEX 5N and the Olympus PEN EP3 shows, the NEX 5N stays ahead in term of image quality. But the PEN EP3 and the other micro-four-third cameras by Panasonic and Olympus offer a much smaller form factor, especially in term of lens size.